School Governors. Seriously, what do they do?! 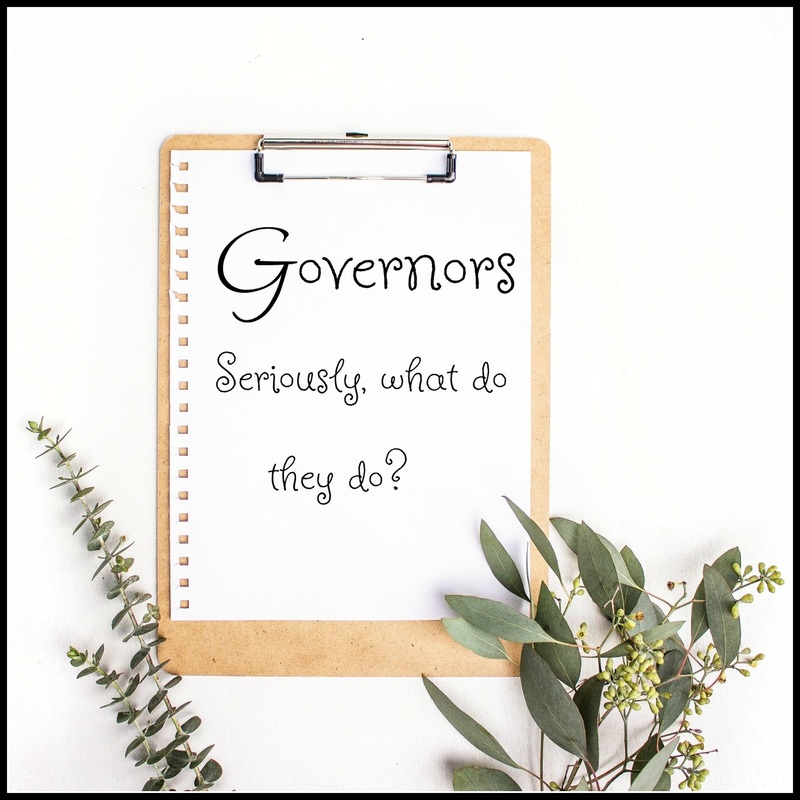 This is a question I get asked a lot, so I thought I would write about my experience as a School Governor and perhaps lift the lid on the mystery. It all began a couple of years ago, when two posts became available at my son's school. My daughter had already been through the same school and I had often considered how I could make myself useful. I always lacked the confidence to take on a role such as this, though, and didn't think I had enough to offer. However, since then I had completed a Level 3 NVQ as a Teaching Assistant, which I felt might give me a useful skill to contribute. Also, as a mother myself, and with my experience working in various schools in the area, I felt the time was right to put myself forward. In all honesty, I was a little unsure what the job entailed. I knew that it was an essential role, which was voluntary and therefore not always popular. I was a lot more available than some parents who worked full time, so felt it was right that I should give up some of my time for this important post and contribute a little to my son's education. It became apparent early on that I wasn't expected to know very much, which was handy because I didn't. I felt a little out of my depth to begin with, and actually still do sometimes, because the amount of jargon and abbreviations that come up is absolutely staggering! It's like another language entirely sometimes! I soon found out though, that there are usually other people around the table that are as confused as me, which really helps. That is actually the best part about being a School Governor, everyone brings a different skill set and quite often comes from a different background with different ideas and interests, so there is a real mix of talents and abilities. It really doesn't matter who you are, you still have something relevant to contribute. For example; if you are a single parent, or struggle financially, or work full time, or whatever, you may bring a completely different viewpoint to any given situation and might be able to see things from an entirely unique perspective. You represent, not just parents in general, but specifically, parents who face the same struggles or challenges that you do. Fortunately, there is a really useful introductory course that all governors are required to attend. It helps, because you meet lots of other people who don't have a clue, and also get a better idea what's expected of you. On the course, I learned what makes a good governor, more about the role and what your responsibilities are. Basically, your job is to act as, what is often referred to as, a 'critical friend'. This means offering constructive criticism and being part of the solution, instead of just moaning about what you think is wrong. It's also not about trying to change how the teachers do their jobs. They are the teachers, after all. There is a lot of emphasis on monitoring and management. Our job is to work out where the school wants to be, what we are doing well and where we could improve and work out the strategies to get us there. 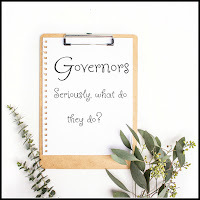 Asking questions is a very important part of being a Governor. As part of our monitoring role, we have to ascertain all sorts of different facts, such as; what strategies are working, what resources might be useful to buy, how we are doing compared to other schools and where we could improve. Questions also help to ensure that the school is recording and tracking progress effectively, so we can be sure that we maintain high standards. We work closely with our Headteacher and SLT (Senior Leadership Team, see, more abbreviations!) who provide us with lots of data, in the form of graphs and charts, as well as presentations, to ensure we know exactly what is going on with our pupils' learning. The data is the bit I find most difficult, but, fortunately, as we are a team, I am allowed to be good at other things, and if I don't understand the data, there's always someone I can ask. Another way we find out how the school is doing, is through Governor Days. These are great fun and you get to see a real 'behind the scenes' of the school day. We do class observations, where we are meant to watch what goes on during a lesson, but nearly always end up getting involved in something, I've trooped around a field collecting leaves, guillotined coloured paper, and all sorts of other fun activities, it's so hard not to join in! We also take part in Learning Walks, where we are shown around the school and see evidence of the learning that goes on, through work books, class displays and interacting with the children. A lot of people don't realise that another important part of being a Governor is providing a link for parents. This could be an informal conversation, perhaps to answer a question, or make a suggestion to improve the way the school runs. Governors try to be available at school functions, to ensure parents have an opportunity to get to know us and find out more about our role. In some cases, though, our job involves helping to sort out disagreements and disputes between parents and the school. We are completely impartial and, should a dispute arise, we have stringent procedures in place to ensure fairness to all parties. Our aim is to help parents resolve matters so that everyone is satisfied. We will always try to do this amicably, and it's surprising how often having an impartial third party can help find a resolution, but, where this isn't possible, the Chair of Governors can launch an investigation to ensure the parents' views are heard and the complaint is taken forward, strictly adhering to the Local Education Authority Guidance for Complaints. It's very rare that complaints are such that they can't be resolved between parents and staff, but I think it's important that we are there to help if necessary. I have been really surprised by all the different roles involved in this post and have really enjoyed seeing school life from a different perspective. It's certainly proved to be very educational! That's is a really interesting insight into life as a school governor Lucy. I always presumed you needed to know loads about how schools are run, so it's reassuring to know that as long as you have an interest in your child's education and/or the school system you can be a valuable asset to the school. Love this post! I became a staff governor at the secondary school I teach and it is amazing how much I actually learnt from the process. I can't recommend being a governor highly enough even if just to give an insight into the education system. Thank you and I totally agree, I find it all really interesting and wish I had done it when my daughter was at school! Is Customer Service Dead? Not in John Lewis!